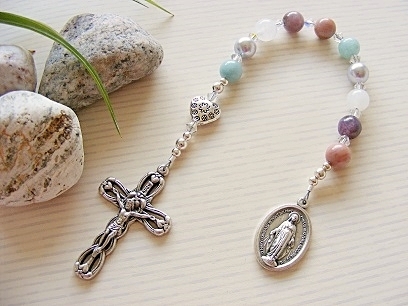 Pocket sized one decade rosary beads and chaplets. 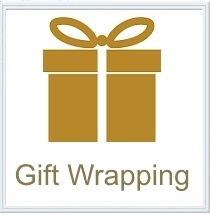 Makes a perfect companion for travelling, pop one in your bag or pocket for comfort and reassurance. 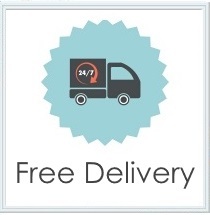 If you need any special requirements, please don't hesitate to email me and I'll be happy to help. Measuring approx. 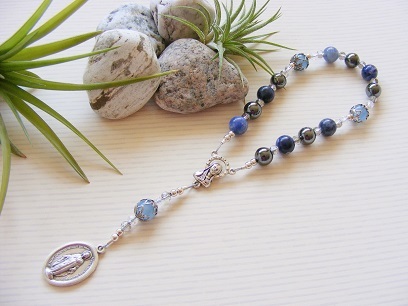 20cm in length, this beautiful handmade prayer bead chaplet is constructed from 8mm blue aventurine beads, hematite and sodalite beads. 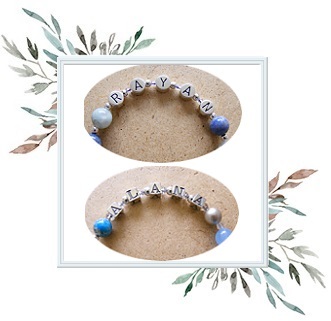 With 3mm silver plated spacer beads, intricate bead caps and faceted clear crystals. A Miraculous medal completes this 15 bead chaplet. Comes with a prayer card. Please click on image for a larger view. Measuring approx. 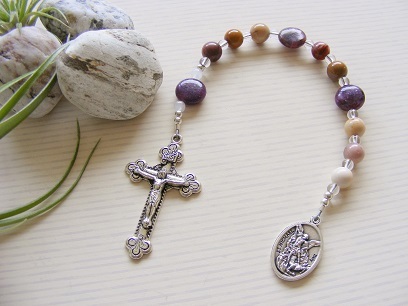 20cm in length, this beautiful handmade one decade rosary tenner is constructed from 8mm mookaite beads, clear crystal spacer beads and large lepidolite coin beads. A silver plated crucifix and Saint Michael medal is attached. Comes with a prayer card. Please click on image for a larger view. Measuring approx. 19cm in length, this beautiful handmade prayer bead chaplet is constructed from 11 gemstone beads and two Tibetan branch focal beads. 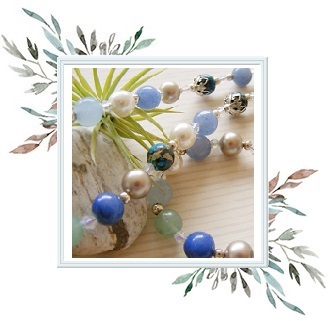 The 8mm gemstones are: peace jade, blue aventurine, hematite, white jade, amethyst and blue impression jasper. 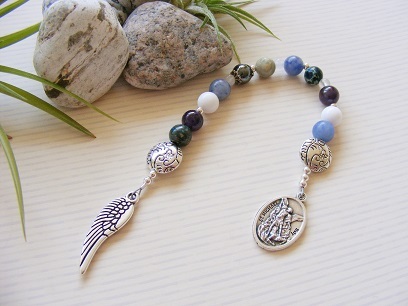 A beautiful angel wing and a Saint Michael medal completes the prayer bead set. Comes with a prayer card. Measuring approx. 20cm in length, this beautiful handmade one decade rosary tenner is constructed from 8mm pink rhodonite beads, swarovski lavender pearls, swarovski crystal spacer beads, lepidolite beads, blue sponge quartz and white jade beads. A silver plated crucifix and Miraculous medal is attached, with a Tibetan Heart bead for the Our Father. 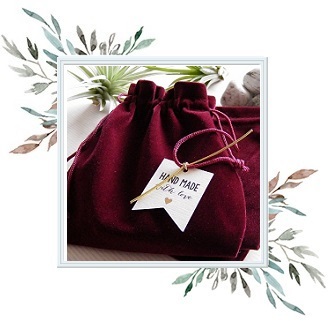 Comes with a prayer card. Please click on image for a larger view. Measuring approx. 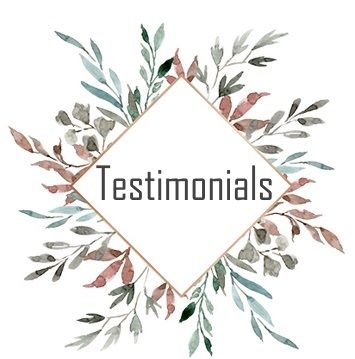 20cm in length, these beautiful handmade prayer beads are constructed from 8mm faceted moss agate beads, faceted black banded agate and amethyst beads. With 3mm silver plated spacer beads, bead caps and clear faceted crystals. 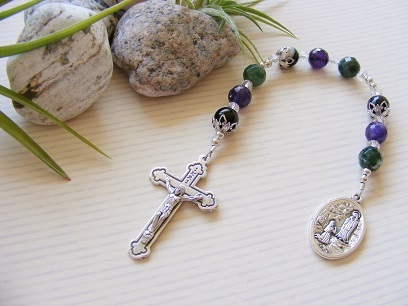 A beautiful Lourdes medal and an elegant crucifix compliments this exquisite 9 bead chaplet. Comes with a prayer card. Measuring approx. 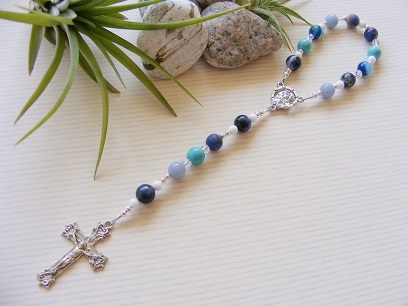 21cm in length, this beautiful handmade one decade rosary is constructed from 8mm sodalite beads, angelite, frosted sodalite, turquoise and blue impression jasper beads with 4mm white jade spacer beads. 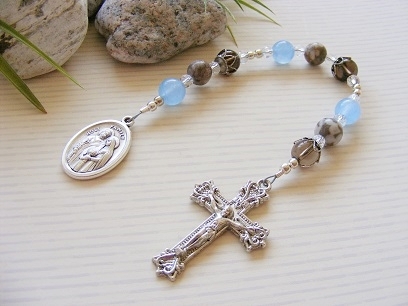 The one decade rosary has a silver plated crucifix attached and comes with a prayer card. Please click on image for a larger view. Measuring approx. 20cm in length, these beautiful handmade prayer beads are constructed from 8mm smoky quartz, blue jade and fossil crinoid beads. 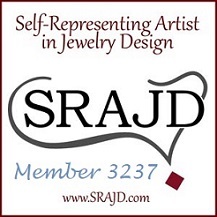 With 3mm silver plated spacer beads, crown bead caps and clear faceted crystals. 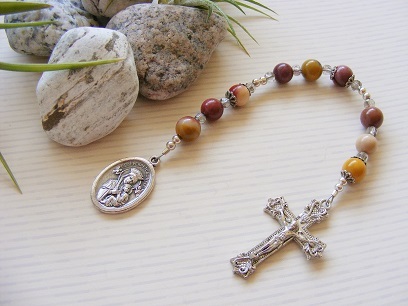 A beautiful holy family medal and an ornate crucifix compliments this 9 bead chaplet. Comes with a prayer card. Please click on image for a larger view. Measuring approx. 20cm in length, these beautiful handmade prayer beads are constructed from 8mm mookaite beads, with 3mm silver plated spacer beads, floral bead caps and clear faceted crystals. A beautiful Our Lady of Perpetual Help medal and an ornate crucifix compliments this exquisite 9 bead chaplet. Comes with a prayer card. Measuring approx. 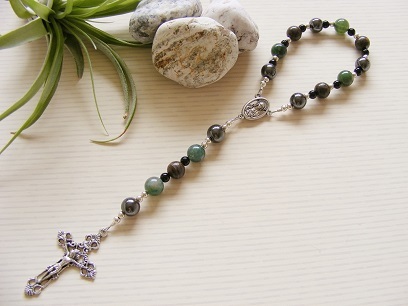 21cm in length, this beautiful handmade one decade rosary is constructed from 8mm moss agate beads, hematite, bronzite, antique silver beads and 4mm black onyx spacer beads. 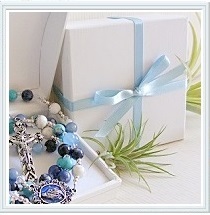 The one decade rosary has a silver plated crucifix attached and comes with a prayer card. Please click on image for a larger view. Measuring approx. 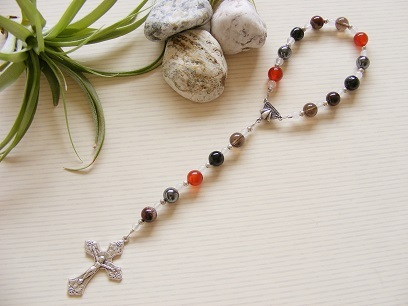 21cm in length, this beautiful handmade one decade rosary is constructed from 8mm carnelian beads, hematite, black banded agate, brecciated jasper, antique silver beads and 4mm white jade spacer beads. 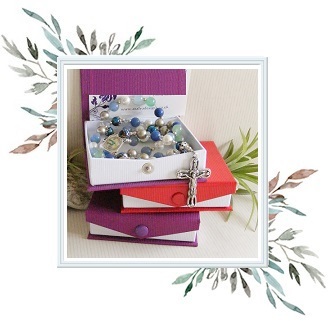 The one decade rosary has a silver plated crucifix attached and comes complete comes with a prayer card. Please click on image for a larger view.